TE Connectivity has launched a high-density series of 30-23 modules for aerospace that boost the connection density by 50% to save both space and weight, writes Nick Flaherty. Designed for EN4165, BACC65 and ARINC 809 shells, the DMC-MR 30-23 AA modules achieve higher density with a reverse design that protects against damage due to exposed contacts. The increased density of the new 30-position modules provides a 50% increase in contact counts over the existing 20-22 modules, allowing two 30-23 modules to provide the same 60-contact density as three 20-22 modules. 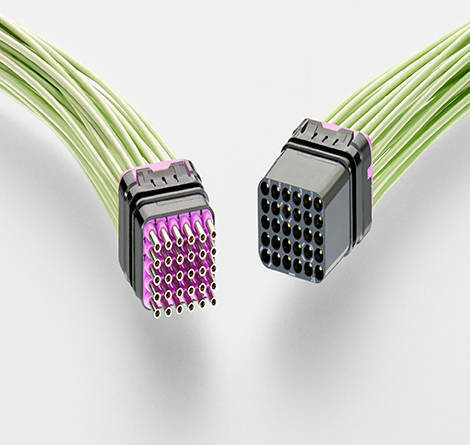 This reduces the connector and harness sizes, enabling space and weight savings. TE’s plastic clip technology provides additional weight savings and simplifies the assembly process, providing possible weight savings of up to 20%. The high-density modules are aimed at applications such as in-flight entertainment and cabin systems, high-speed Internet access, lighting and window dimming, power distribution and control, and electrical wiring and interconnect systems.